The question is often asked, "What do you mean by the term creation model" ? A model is a framework around which observations and facts are organized. Thus, the creation model is a framework of information in which the universe and its living systems are explained as having been designed and sustained. In the course of forty years involving Biblical and scientific research, our Director has formulated a composite Creation Model. Its basic tenets are held by leading creationists. In addition to these basic pillars, distinctive research programs have led to specific areas of refinement in this particular model. An outline of this model follows. A tremendous pyramid of evidence for design and recent creation is available for detailed study. Romans 1:20 states: "For the invisible things of him from the creation are clearly seen, being understood by the things that are made, even his eternal power and Godhead: so that they are without excuse." Scientific evidence for creation abounds in areas of objective observation. Scholars in various scientific disciplines have written about the incredible complexity in living systems and the structure of the universe. This complexity is beyond the possibility of natural development. Below we begin with a brief summary of the Creation in Symphony Model by our Director, Carl Baugh. 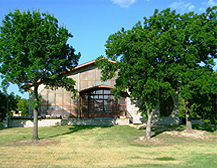 Original research carried out at the Creation Evidence Museum in Glen Rose, Texas in the mid-1990’s utilized the physical atmospheric parameters of the hyperbaric biosphere on premise. Alteration of atmospheric parameters included increase of atmospheric pressure, oxygen and carbon dioxide ratios, and electromagnetic moment. Under these alterations physical structure and protein expression of snake venom were significantly changed. Comparison was made between ambient control conditions and hyperbaric biospheric conditions. In the independent analysis and correspondence related in the following pages some protein expressions were enhanced, some were diminished, some were eliminated, and some expressions not seen under ambient conditions were seen under hyperbaric conditions. Evolutionary theory requires millions of years in the formation of coal in order to afford time for the development of living organisms whose fossils. The Fossil Record...Evolutionists have constructed the Geologic Column in order to illustrate the supposed progression of "primitive". Many people know that the earth has a magnetic field, but few are aware that this field is shrinking. This decrease has been measured over a period of 150 years. Of all the lessons which the Earth continually teaches us, perhaps the most obvious. Scientific Problems With Macroevolution: (Karl Popper's definition of the scientific method ). The largest quantities of woolly mammoth remains are found in Arctic and sub-arctic. A less-common form of the carbon atom, carbon-14, is used today by scientists. Carbon-14 and Recent Creation: Various data and numerical statistics are discussed. Properly understood, these data render C-14 dating techniques relatively reliable only within a few thousand years before present and point to a recent creation. The Heavens and Recent Creation… Planet Earth travels 66,000 miles per hour as it orbits the sun. That specific speed perfectly offsets the sun’s gravitational pull and keeps earth’s orbit the proper distance from the sun. Earth’s magnetic field is affected by the sun’s rays, and any significant disruption of the earth-sun magnetic balance would bear consequences. That a maker is required for anything that is made is a lesson Sir Isaac Newton was able to teach forcefully to an atheist-scientist friend of his. Sir Isaac had an accomplished artisan fashion for him a small scale model of our solar system which was to be put in a room in Newton’s home when completed. The assignment was finished and installed on a large table. The workman had done a very commendable job, simulating not only the various sizes of the planets and their relative proximities, but also so constructing the model that everything rotated and orbited when a crank was turned. It was an interesting, even fascinating work, as you can image, particularly to anyone schooled in the sciences. MYSTERY SOLVED! The mystery and confusion can now be laid to rest. The Adams family is held in high esteem among honorable citizens throughout the Glen Rose area. The most famous of the brothers was Ernest Tolbert Adams, an Oxford scholar and noted attorney. Ernest is credited with discovering the first dinosaur footprints and several human footprints in the sedimentary rocks of the Paluxy River. George Adams was well respected in his own right as a gifted painter and rock mason. I held extensive discussions with George’s daughter and son-in-law during my early years in Glen Rose. These good people were friends of the museum and, being familiar with their father’s skills, affirmed that none of the footprints in our possession were carved. Each time our museum team discovers new human footprints in the sedimentary rock some evolutionist will refer to the 1930’s carved footprints, and erroneously claim that we have simply re-discovered one of those prints, or perhaps carved them ourselves. Such was the case in the recent discovery of the marvelous “Delk” footprint. The mystery and confusion can now be laid to rest. Dennis Moore, a local pastor and friend of the museum, was searching through the rock and dirt at the old Adams home place. As the enclosed photo shows, he discovered the original carved footprint half buried near the cellar. With permission from the family we had CT Scans performed, and found no compression density under any of the carved print. All of our genuine footprints show clear density compression in the appropriate areas. Thank you for your faithful support of our credible research and declaration of creation truth. We are pleased to be your representative in the cause for our Creator. Those familiar with surface crystallization of limestone deposits can readily see the lighter (denser) surface material. The carver cut through the crystallized surface material rendering the depression of a human-like footprint. Notice there is no lighter (denser) compression whatsoever under the carved contour.